today is the national holiday to commemorate the end of the WWII. Yet, surprisingly quite a few of us have met in the office. But the atmoshpere is very relaxed and we will call it a day early. The week has been spent mostly on smaller tasks (quite a few of those were non-game-development related). We had been using Github issues for a long time. But we often felt we were missing the big picture. 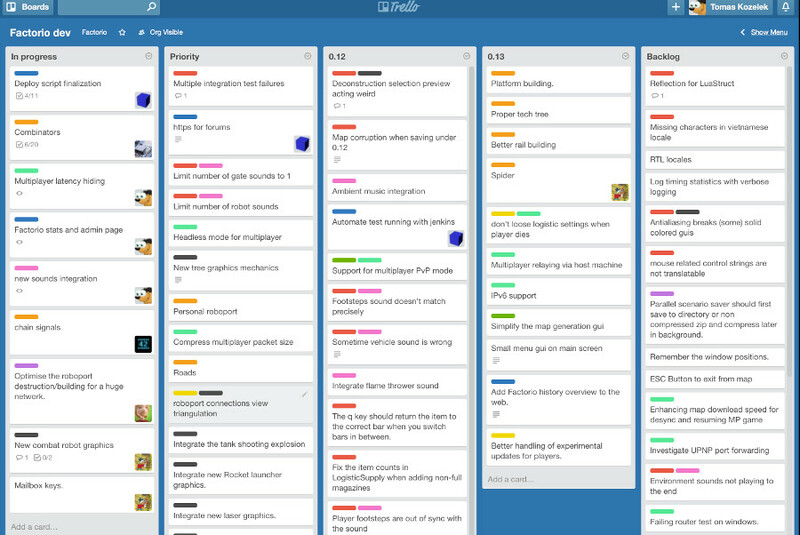 Our GFX department has been using Trello for quite a while and they have been really happy with it. So we decided to give it a try as well. So far the feeling has been really positive. The result is that people started using the system more actively than the Github issues before. For us the biggest benefits are simple manipulation with cards and good overview of work that is there to be done. You can see an excerpt from our dev board below. Kuba has finished the migration to Linode. The changes went live at the beginning of the week. We have 3 virtual servers in London and 3 across the US. All the demo, alpha builds and updates are served from these as well as most of the assets for the webpage. This should result in game and update downloads being faster (compared to before there is more bandwith and we have localised servers in Europe now). Robert is finishing with the first version of combinators. He will write an indepth description about it probably for the next FFF edition (or the one after). Already he has built things like timers, memory and other interesting setups with them. Martin has finished with the chain signals and now is writing tests for them. Also, he managed to get our distributed C++ compilation up and running for OSX system. Michal is working on optimizations in logistic network when roboports are removed. Michal has joined the team for probation two weeks ago and this is his first task. With especially large logistics networks it could take seconds to update all the datastructures. After the changes this should not take more than couple of milliseconds in the worst case - so basically skipping a frame or two. Last weekend there has been a small spike in sales probably due to Direwolf20's videos. This was a final push for us to do something which we have wanted to do for a long time. Namely to make some simple reports from our sales data. So I have written a small python website that connects to our production database and generates couple of basic reports. Below you can appreciate our overall sales report with a few handmade tags. After all the C++ programming working with python is real fun. So I went couple of steps further and made a few tools to handle our support emails easier. Graph from our sales data starting more than 2 year ago. The Y axis represents number of sales in a given month. Green are overall sales. Blue are sales to EU. Red are sales to US. Yellow are sales to the rest of the world. 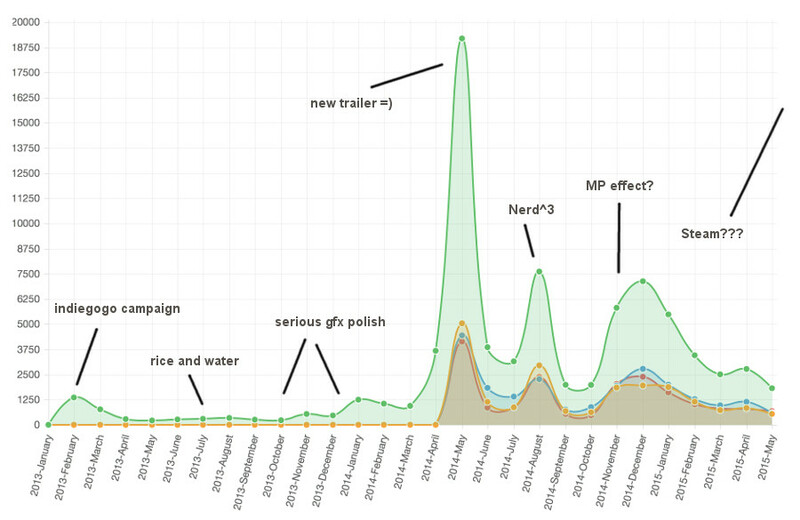 We started collecting the sale location data only after April 2014. The at our forums thread at our forums is ready for your comments.